The Oxford English Dictionary defines fandom as “the world of enthusiasts for some amusement or for some artist.” Fandom refers to a collection of fans of the general pursuit or to a collection of fans of a specific practitioner of the pursuit. So, K-pop fandom can refer to fans who identify as fans of K-pop, the amusement. Of 790 respondents who answered a question about why they were K-pop fans between April 29, 2011 and April 15, 2012 as part of an iFans survey, many described themselves as fans of K-pop in general, not of a particular group or artist. One respondent noted: “95% of the songs in my Ipod belong to the Kpop genre. Also, I constantly update myself with Kpop news from various internet websites” (Anderson). Another noted “spending lots of time watching Kpop news, videos and listening to Kpop songs” (Anderson). Several respondents also noted that they were members of online K-pop media outlets and cover dance groups. 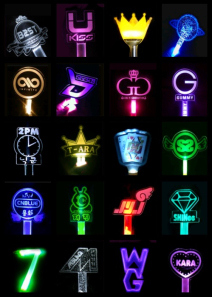 K-pop fandom can also refer to fans who identify as fans of an individual K-pop group or solo artist. While media frequently suggests that K-pop groups are alike, the fandoms of specific groups and artists are very different. 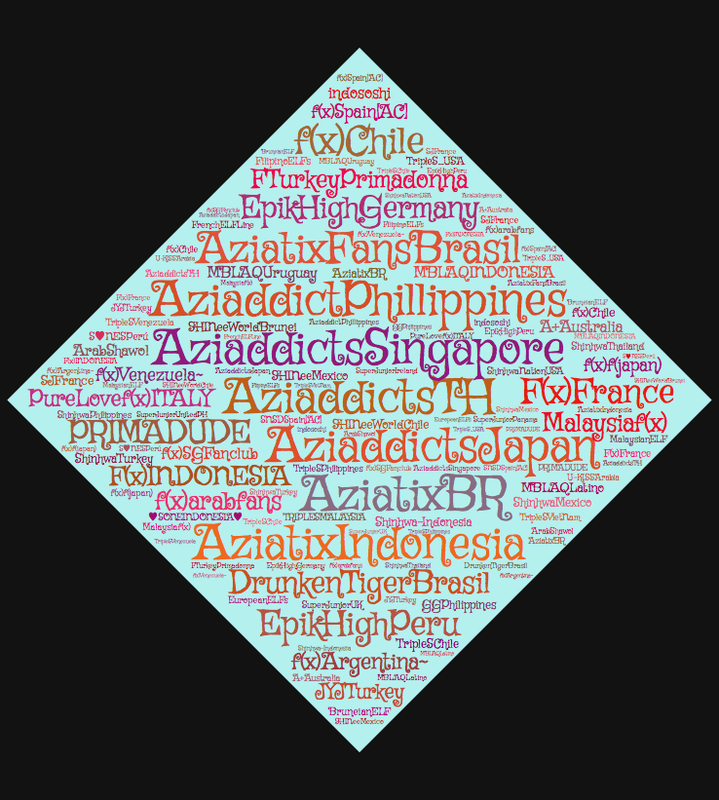 Some of the more defined fandoms have developed their own culture and languages. Individual K-pop fandoms are made even more complicated by their global nature, as they involve fans inside and outside of Korea. On one hand, there are official fan clubs sanctioned by the artist such as those described by Paul Théberge: “Since the mid-1990s, it has become common for stars to have their own professionally run websites. . . . These sites are run variously by artists, their management, their record companies, or more recently, by specialized third-party interests” (493). Often after a K-pop group or artist debuts, management and the artist will name their fans, create an official fan club and designate an official fan club color. For example, Starship Entertainment debuted the male group Boyfriend in May 2011, and announced the name of the fanclub in August 2011: “Despite many feeling ‘Girlfriend’ would fit the group’s fanclub name perfectly, Boyfriend felt the name would have not been appropriate for their male fans, so instead Boyfriend fans will now be called ‘Best Friends’” (“Boyfriend Reveals Fan Club Name). Decisions about fanclub names are often made with fans in mind. Those who obtain membership in these official fan clubs receive perks, including advanced notice of activities, access to merchandise and preference in concert seating. However, most of these official fanclubs are not open to fans outside of Korea. Blogger BOYMILK reports: “Fan club applicants to any fan club for SM Entertainment artists generally must have a Korean Social Security number (chumin tŭngnok pŏnho, 주민 등록 번호) in order to apply. This makes it effectively impossible for international K-pop fans to join official fan clubs for some of K-pop’s most famous idol groups.” Nevertheless, fans outside of Korea have established hundreds of unofficial fan communities on blogs and websites, Twitter accounts, Facebook pages and Tumblrs. The following graphic shows how fandoms are represented on Twitter. It includes fandoms from various countries, including Brazil, the Philippines, Chile, Spain, Indonesia, Japan, France and Italy. It also includes a range of groups, from the “idol groups” like f(x) and SHINee, to bands like F.T. Island, to hip-hop artists like Drunken Tiger and Epik High. While these fan communities are not subject to corporate control and do not receive the perks of the official fanclubs, they do play a significant role in K-pop. For example, Soshified is website for a global community in support of the female group, Girls’ Generation (also known as SNSD). Reporting more than 10 million page views per month, the site has organized meet-ups with fans in the United States and raised money for charitable causes including Japan relief and YMCA’s Youth Center in Seoul. The organization also spearheaded a 2011 “field trip” organized in partnership with the Korean Tourism Organization, which “included the attending of Girls’ Generation 2nd Tour Concert and MBC studio recordings. The field trip was heavily covered by the Korean media and Soshified members were featured in several Korean entertainment news broadcasts and newspapers” (Soshified, About Us). Given the number of K-pop groups and artists and the number of years since the beginning of Hallyu-era K-pop, there are hundreds of fan communities that make up K-pop’s individual fandoms. To further complicate the landscape, some individual fandoms will combine with other fandoms. 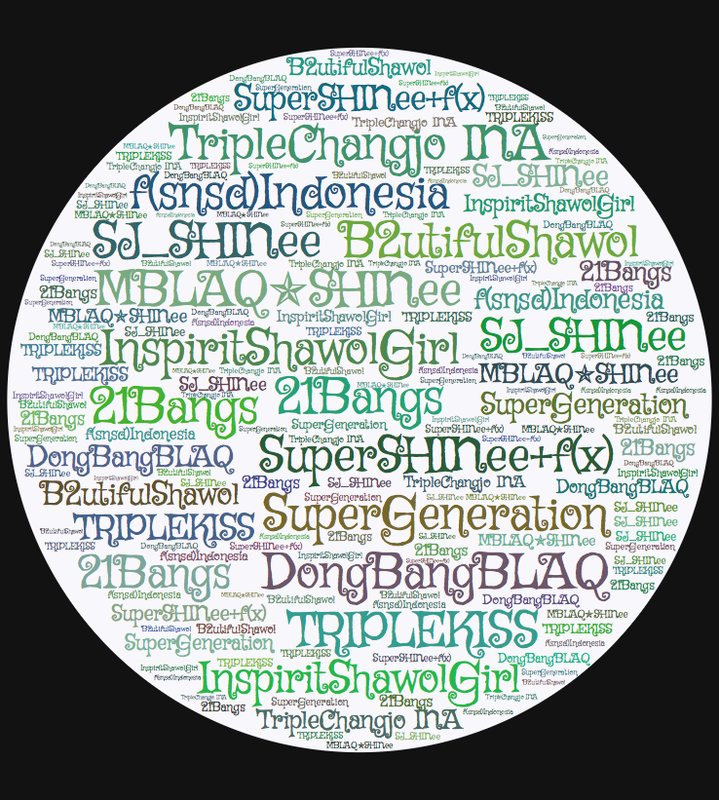 The following graphic represents Twitter accounts of such combo fandoms, such as fans of both Shinhwa and SS501 (TripleChangjo), Infinite and SHINee (InspiritShawolGirl), and Super Junior and Girls’ Generation (Super Generation). Whether talking about the general K-pop fandom or individual K-pop fandoms, the first thing to know is that the landscape of K-pop fans is complicated. Glowsticks. K!. Web. 8 Dec 2013. Word clouds generated from KPK’s Twitter Lists. “About Us.” Soshified. Web. 8 Dec 2013. Anderson, Crystal S. “Hallyu K-pop Fans Data Set.” Unpublished Raw Data, Collected April 29, 2011-April 15, 2012. “Boyfriend Reveals Fanclub Name.” gokpop. 11 Aug 2011. Web. 8 Dec 2013. BOYMILK. “Hypocritical Hallyu: International Fans and K-pop Fandom.” Oh No They Didn’t!. 2 June 2013. Web. 8 Dec 2013. Théberge, Paul. “Everyday Fandom: Fan Clubs, Blogging, and the Quotidian Rhythms of the Internet.” Canadian Journal of Communication 30 (2005): 485-502. “K-pop Fandom 101” by Crystal S. Anderson is licensed under a Creative Commons Attribution-NonCommercial-ShareAlike 4.0 International License. Originally published on KPK: Kpop Kollective on December 3, 2013.